When an EIGRP-enabled router uses a password to accept routes from other EIGRP-enabled routers, which mechanism is used? What is the purpose of using protocol-dependent modules in EIGRP? If all router Ethernet interfaces in an EIGRP network are configured with the default EIGRP timers, how long will a router wait by default to receive an EIGRP packet from its neighbor before declaring the neighbor unreachable? Which statement describes a characteristic of the delivery of EIGRP update packets? EIGRP uses UDP to send all update packets. EIGRP sends all update packets via unicast. EIGRP sends all update packets via multicast. EIGRP uses a reliable delivery protocol to send all update packets. Which destination MAC address is used when a multicast EIGRP packet is encapsulated into an Ethernet frame? What is identified within the opcode of an EIGRP packet header? An administrator issues the router eigrp 100 command on a router. What is the number 100 used for? Why would a network administrator use a wildcard mask in the network command when configuring a router to use EIGRP? What information does EIGRP maintain within the routing table? Which table is used by EIGRP to store all routes that are learned from EIGRP neighbors? Which command or commands must be entered on a serial interface of a Cisco router to restore the bandwidth to the default value of that specific router interface? A network administrator wants to verify the default delay values for the interfaces on an EIGRP-enabled router. Which command will display these values? Refer to the exhibit. R3 has two possible paths to the 172.16.99.0 network. What is the reported distance of the feasible successor route? Refer to the exhibit. R2 has two possible paths to the 192.168.10.4 network. What would make the alternate route meet the feasibility condition? Which configuration is necessary to ensure successful operation of EIGRP for IPv6? The router eigrp autonomous-system command is required within the router configuration mode. Fill in the Blank. Use the abbreviation. 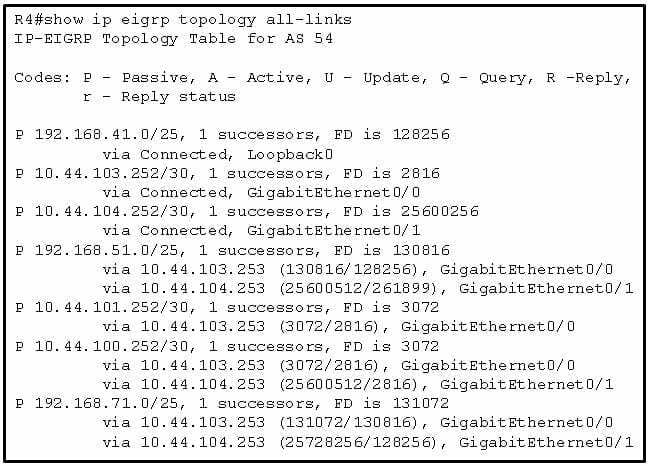 In an EIGRP topology table, a route that is in a/an active state will cause the Diffusing Update Algorithm to send EIGRP queries that ask other routers for a path to this network. Which code is displayed on the web server?